Ready to light up your home? In-cabinet lighting delivers the same benefits of under shelf/cabinet and puck options — with the added advantage of creating a truly unique, and simply stunning, look. Efficient. You do not have to light up an entire room to search for your cookbook or find that midnight snack. And, if you use LED lights, you’ll save even more. Easy… Cabinets are a significant investment in the practicality and enjoyment of your home. Installing lighting is a relatively easy, quick job that will yield exceptional results. You don’t have to undertake a major remodel as you might with pendant and recessed lighting. …And Easy on the Wallet. 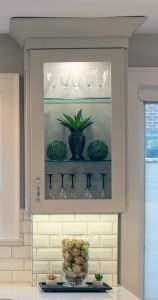 Installing in-cabinet lighting is a budget-friendly upgrade that more than pays for itself in style! Illuminating! Ok, so this is a given! But in-cabinet lighting makes it easier to locate key ingredients for your latest culinary masterpiece, your favorite coffee mug, and other must-have items located at the back of the cabinet. Elegant. Practicality is important; but you should also love where you live. 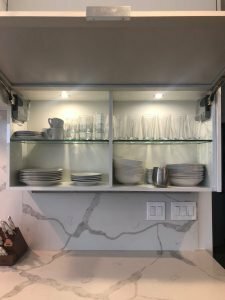 In-cabinet lighting allows you to accentuate the beauty of your items displayed in glass-fronted cabinets without creating a reflective glare. With a streamlined design, you won’t see the lighting components, just your precious keepsakes or gorgeous stemware. Where can you use in-cabinet lighting? Wherever you have cabinets! They are especially useful in the kitchen for the reasons mentioned above, but don’t be afraid to install them in your bathroom, display cases, and hutches. You’ll add a touch of elegance that’s perfectly balanced with practicality. Cabinets are one of the most important elements in your home. Increase their usefulness, convenience, and style with discrete lighting. We are happy to help you explore your options and make the right selection for your needs. ACo wants you to love where you live. Take our quiz and find out how you can enjoy it even more!